Who's ready for Star Trek Discovery? We are! We are! That might be, perhaps, because some of your favorite costume purveyors here at HalloweenCostumes.com are, in fact, huge big-time Trekkies. And, we'll be the first ones to tell you. We've been waiting way too long to see Trek on TV! Star Trek is indeed back on the small screen, and we couldn't be happier. Which is why we wanted to make sure you have the opportunity to dress just like your favorite new characters! Lo and behold, here's this Star Trek Discovery Operations Uniform Costume, fresh out of a new batch of costume styles! Designed to have you stunningly look like you're ready to boldly go where no one has gone before, this costume top captures the screen style of the brand new costume from the hit CBS series. It is officially licensed, and ready for fun! It's pretty easy to slip into, too. It secures in the back, and a stand-up foam collar will have you looking regulation. And, of course, it's fully printed with details from the screen-worn costumes! This costume, of course, is for operations division, so it's got gold accents along with the Operations Starfleet Insignia printed on the chest. No other costume pieces are included with the top, but we've got all the gear to complete your costume sold separately. 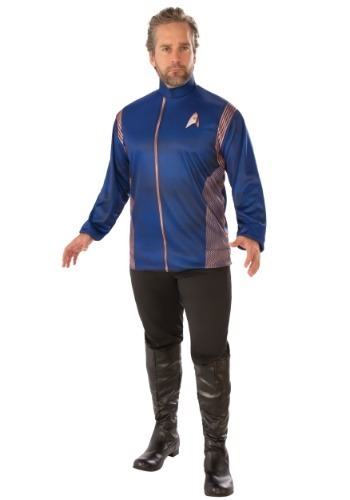 Black pants and black boots will complete the look as we have it pictured, and you can pick up some makeup accessories if you'd like to be a non-human member of Starfleet. We've got you covered, fellow Star Trek fans. So, go on, get this costume, and let's boldly go!